Save space as well as time and trouble with this practical and handsome caddy for large or smaller items. Metal shelving is impervious to wear and tear, so you can put those big, heavy items in, close the drawer, and tuck away enough culinary wares to please the Iron Chef! This smart and stylish addition to your kitchen tucks away big pots, dishes, and other items, handily. The attractive wood finish is also a plus. As creative kitchen storage ideas go, this one’s worthy of any culinary heart of the house. The grainy wood look and sleek metallic handle combine to make a sturdy drawer structure. And, it complements any kitchen design and hard-to-please chef with its easy-to-use functionality. The best properties of the hidden shelves are not only to be found in their privacy, elegance, and style. Their fine look is a subtle feature of what a modern kitchen needs to represent. The designs inspire and serve practically. They are in tune with everything else around the room, correspond to the atmosphere. Without a doubt, this is a special, serious furniture piece. It can be manufactured in a variety of colors, combination of nuances, so it becomes perfectly unique. There is plenty of space inside that will safely hold the objects of your choice. The kitchen is now a space for creativity and freedom because you have the practical solutions for all of your needs. Then, it somehow becomes easy to feel like the director of the culinary orchestra! You’ll love the stackable utility of this useful kitchen buddy! 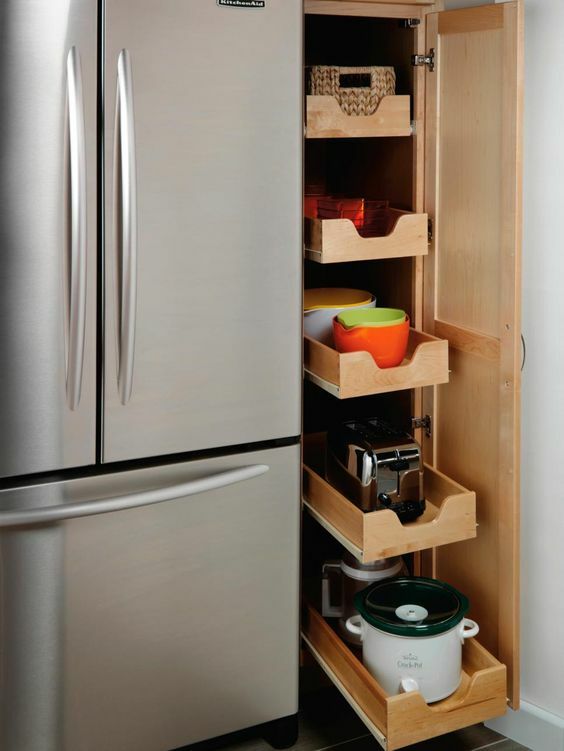 You can store light or heavy items away with ease, roll each of the five drawers back, and close the pantry door. You can also fit this into about a foot-wide area, making the most of your cubic feet of usable space. The sturdy pine wood shelves themselves are designed for years of constant use. The bookshelf design appeals to those who want their kitchen items within easy reach. Install even in the smallest kitchen area, and enhance any cooking space by making a variety of items easily accessible. Here’s another fabulous kitchen storage solution. Put away those utensil jars cluttering your countertops because the “ultimate utensil drawer” organizes and puts within easy reach all your many varied utensils with one easy opening of a drawer! 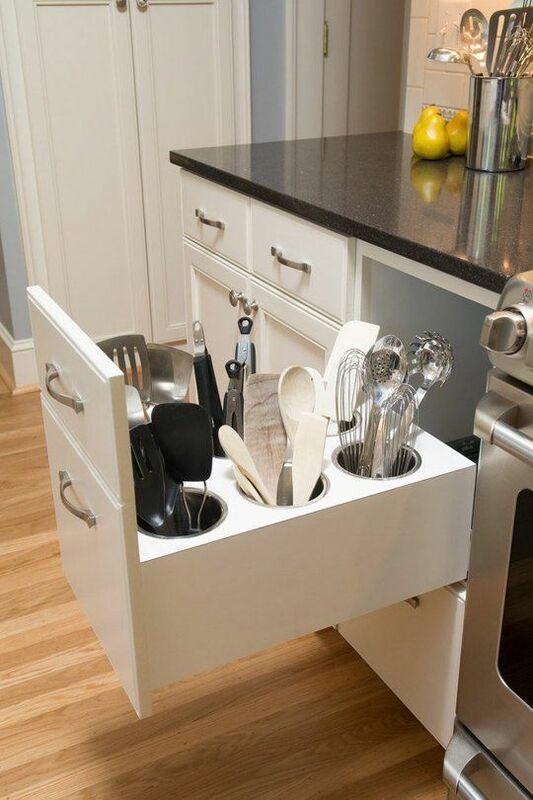 Imagine being able to access all your serving utensils with the ease of opening one silverware drawer. Now, it’s just that easy. You can even organize your utensils and store them in metallic vessels embedded in the drawer. 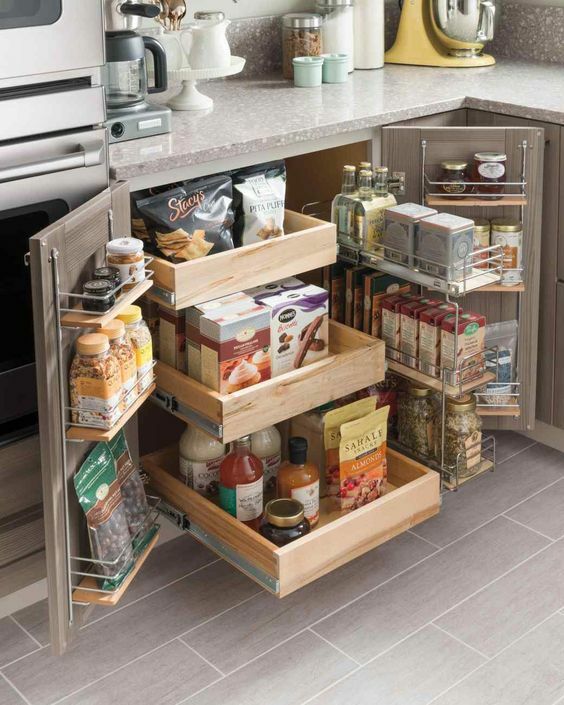 Like the hidden shelves caddy, it’s “out of sight, out of mind” once you’ve used, washed, and put away your spatula, serving spoons, tongs, whisks, and other utensils. 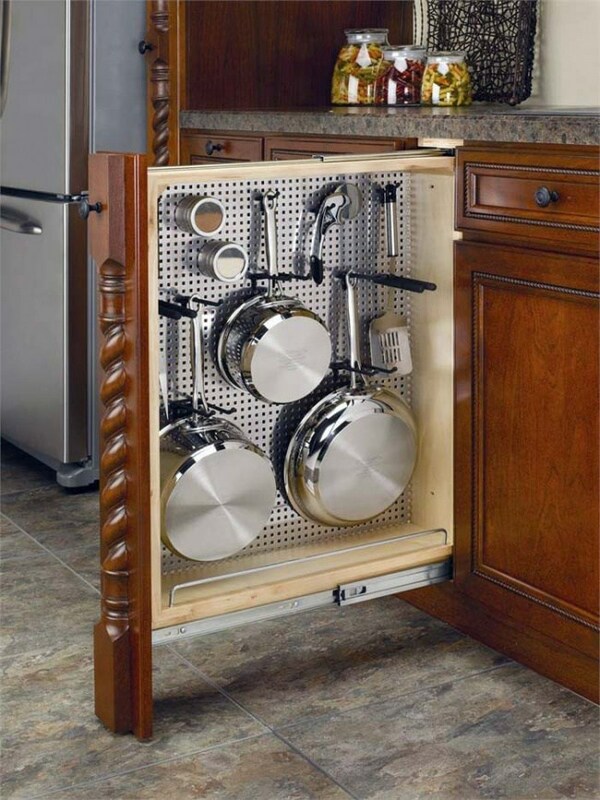 This creative kitchen storage idea is tailor-made especially for those who live in earthquake-prone areas. Or, for those with a large amount of china or dinner plates that you want to keep from shifting around. 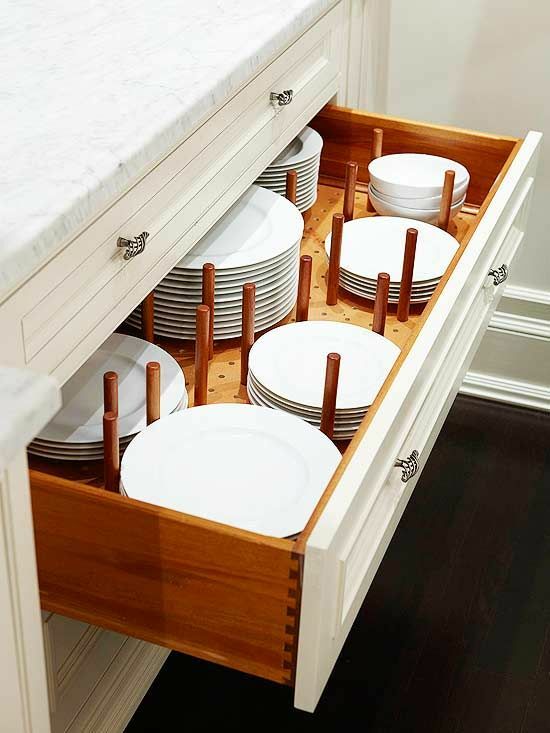 Tall wooden pegs placed within the wide, shallow drawer keep plates in place in case of unexpected jostling. Californians, take note. The pegs also help keep plates, bowls, or other dishware organized by size. This is important visually to some, who, with one look, will be able to sort out the large serving plates from the teacup saucers. This is perfect for china hutches, or any wide storage drawers meant for holding breakable dishware. As ingenious kitchen storage solutions go, this is perhaps the most popular one for homeowners, going way back. With no other methods of kitchen storage, people would simply throw up some wood planks on the wall, throw their wares upon them, and call it good. That’s the idea here: keep it simple, practical, even traditional, and do it with your own flair for the practical. Open wood shelving looks conventional or ordinary, and that’s what may appeal to many who don’t want “fancy-schmancy” kitchen storage solutions. One advantage open wood shelving has over the hidden storage ideas: You can always see what you have and where it is at all times! This rather ingenious kitchen storage idea is creative, practical, and clever. Corner drawers at a 90-degree angle can work against one another, so why not combine them into one big drawer? The single, diagonal drawer, as opposed to having the two corner drawers at odds with one another lets you make the best use of the space, and have ergonomic ease of flow as well. The 2-in-1 diagonal drawers are a useful alternative to the lazy susan caddies used in many kitchen corner drawer spaces. 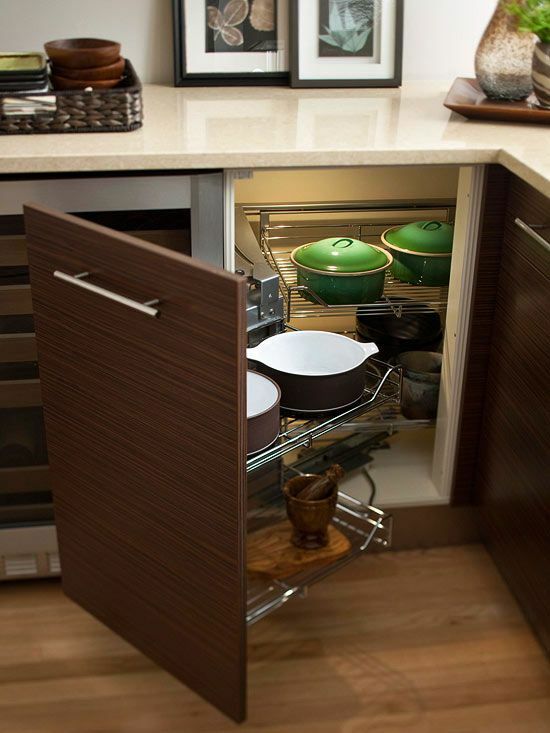 Some may prefer the diagonal drawers to the lazy susan fold-out door. 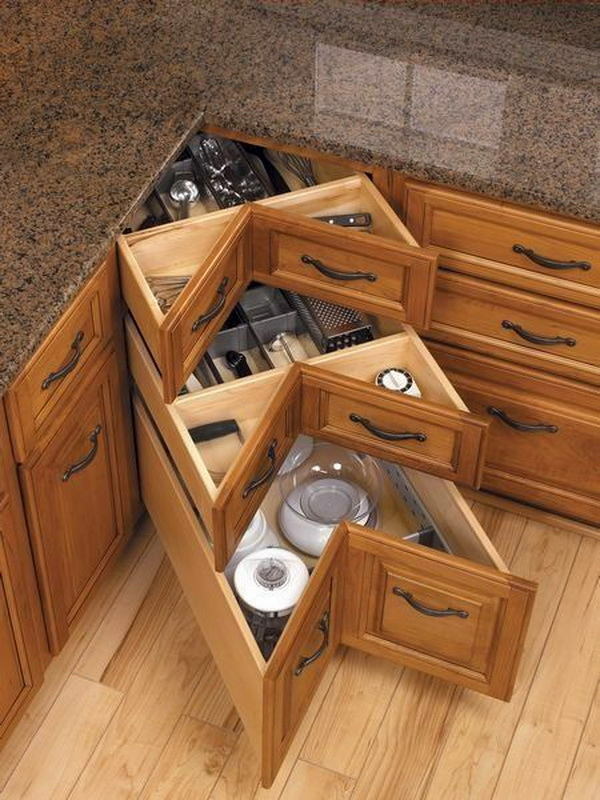 This lazy susan alternative also lets you combine kitchen implements into segmented built-ins within the drawer. 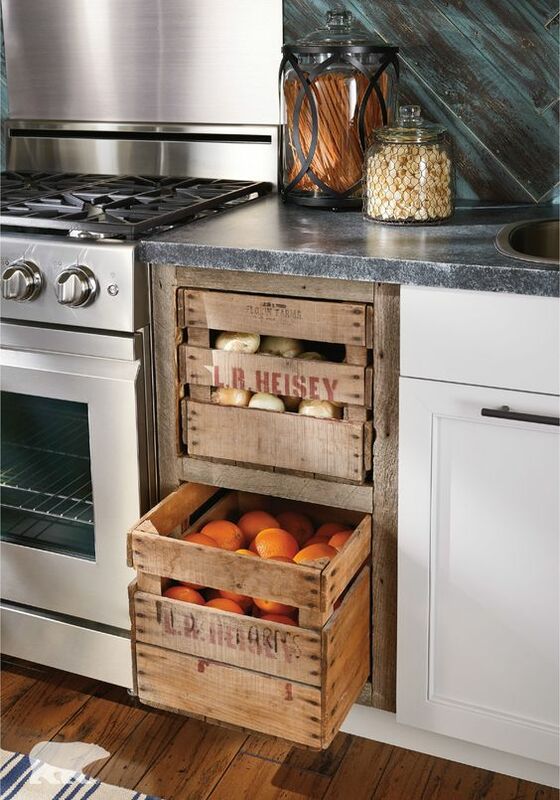 For those who enjoy the rustic, down-home look, these produce crate drawers fulfill a practical need for a kitchen storage solution and tell your guests that you embrace farm-to-table values. Whether you have a stripped-down and simple kitchen design, or a more upscale aesthetic plan, the rustic wooden crates work as an alternative to drawers-as-usual. So, where can you scare up some produce crates? Check your local grower, farmer’s market stand or store. They may have a couple sitting around. Into DIY solutions? You can even build your own crates from palettes or spare lumber. And, for the really committed do-it-yourselfer, your produce crate drawers can even double as a produce hauler, saving on grocery bags when you go shopping! If variety is the spice of life, then these rolling spice rack and condiment drawers are both! These thin, deep vertical drawers hide your goodies away when you don’t need them. For those who use a lot of spices to cook with but have trouble storing them, this is the perfect kitchen storage solution. Not only can spices store easily but other condiments can as well, such as olive oil. The design of these vertical drawers perfectly suits those who want creative kitchen storage solutions at a relatively low cost. 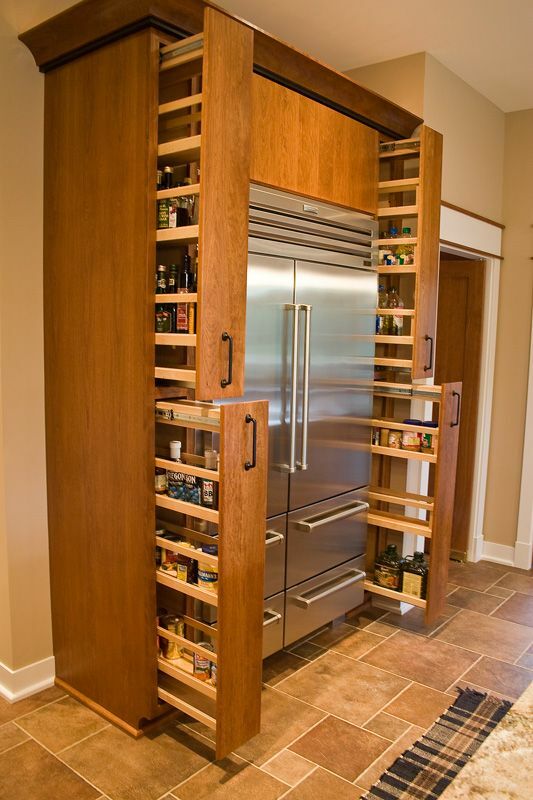 This is another storage idea that fits a lot into tight spaces. They also look great, either rolled up or rolled out! For those of you with limited kitchen space, the ingenuity of this storage solution will wow you. 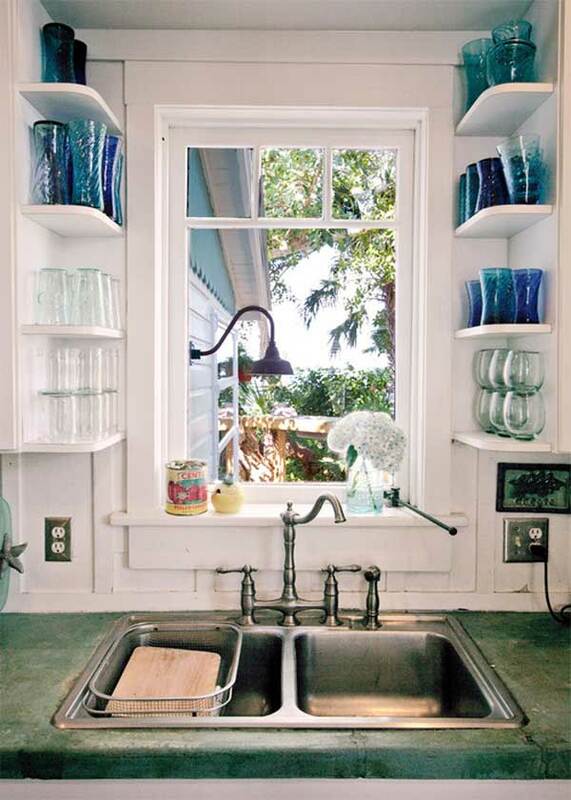 12 handy shelves fitting into an area about the size of a dishwasher makes for a truly inventive space saver! You can fit a complete pantry for one or two people into this crafty optimizer of cubic footage. Works for everything from small jars to larger boxes, jars, bottles, and then some. Plus, you’ve got your pantry located right where you cook, as opposed to it being almost separated from kitchen areas in most houses. Good things do come in small packages! Economizing and consolidating space is attractive to anyone these days, and this multi-drawer and shelf storage solution calls out to bigwigs and minimalists alike. Economy, practicality, and aesthetics all combine here to make this an attractive kitchen storage solution for any and all. Whatever your reasons for having less space, make the most of it with this design concept that makes the most of both space and sensibility. Notice the maximization of counter, cupboard, and drawer space. The only thing missing from this picture is a pot rack hanging from the ceiling. But, no worries–the big pots store away handily in the ample drawers. Add to that the open wood shelving, blending in almost invisibly in the white and bright design concept, and you have an attractive, fully functional kitchen that leaves no storage stone unturned. 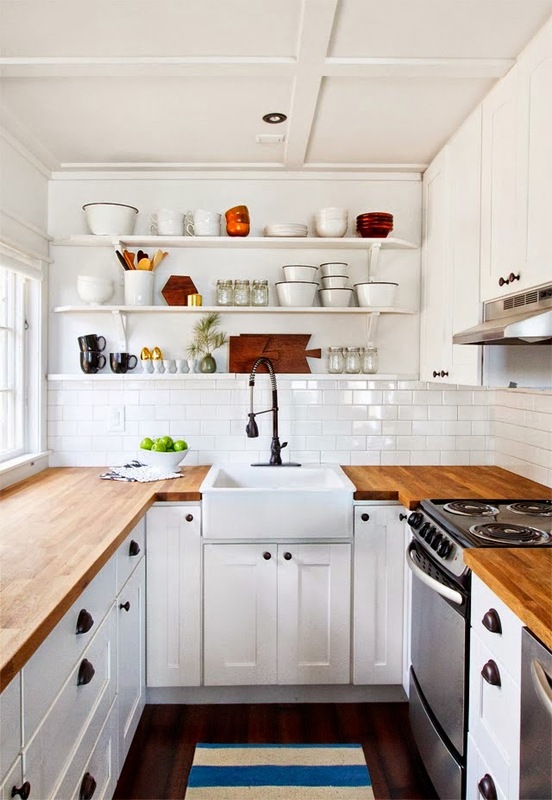 Note the deep sink with utility faucet, so you can work in an uncluttered manner, keeping your kitchen ship-shape for master chefs or amateur gourmands alike. Remember our hideaway spice and condiment drawers? This is somewhat the same concept, with a wall-hanging design fitted into a thin, slide away drawer for maximum space-saving utility. 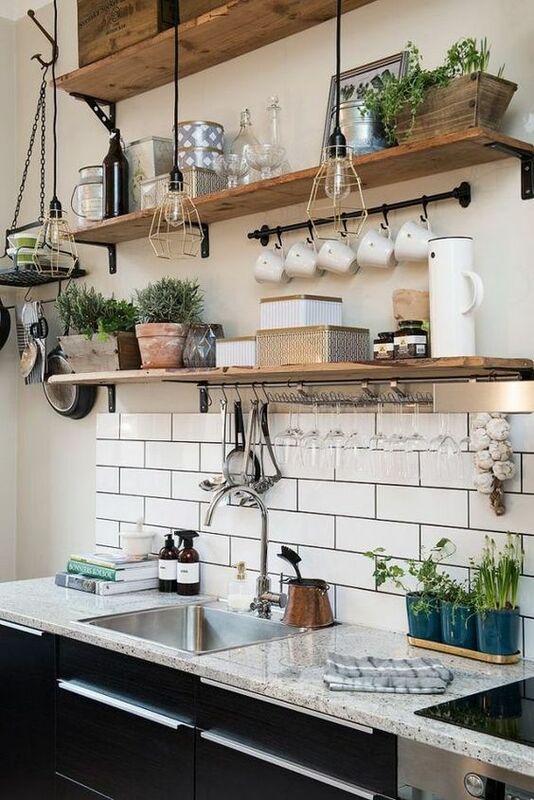 This one will prove especially attractive to those who work a lot with pots and pans, but who lack the space to hang or store them. Or, to those who just can’t do with the extra clutter “up top”. Not only pots and pans can hang here, but also utensils and other implements hide away snugly in this uniquely useful storage concept. This one is also a good idea for more vertically-challenged folks among us, who may not like getting up on step-stools to reach hanging pots and pans. Either way, this one’s another winner for the spatially minded storage lover. Here’s another ingenious, creative kitchen storage solution. For those with a minimum of wall space in your kitchen, consider putting open wood shelving along the sides of cupboards just above or beside the sink area. Save space along with time and energy with this kitchen storage design, which allows you to simply stand at the sink and reach up and pull drinking glasses off of proximally-located shelving. Californians, you may want to add a one-inch “retaining wall” around the shelf edges to keep glasses from sliding off and shattering, in case of an earthquake. For vertically-challenged folks, you may need a step-stool to get to the upper shelves, but this kitchen storage solution is still perfect for just about everyone. 15 Functional and Cozy Scandinavian Interior Design Ideas To Inspire You!